Manufacturing & Company Overview | Precision-Tek Mfg., Inc.
For the finest in Swiss Screw Machined products, you can rely on Precision-Tek Mfg. We are specialists in fabricating and supplying Swiss Screw Machine products, Custom screw machined products, CNC Turnings, and other CNC Machining. We have been a Swiss Screw Machine product supplier to a number of Industries for over 20 years. We utilize a variety of turning solutions. We also offer extensive CNC Metal Fabrication capabilities. We machine a broad diversity of materials in utilized ranging from Brass and Aluminum to Exotic Stainless Steel and Titanium. With many years of experience and with talented Engineering we can offer a variety of solutions to serve your production requirements. 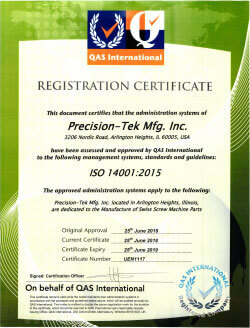 Precision-Tek manufactures the high quality screw machine products with zero defects. We use our knowledge and experience to provide you with the finest machined components to spec and on time. If your project has challenges, we will partner with you to find the solutions with our Engineering staff. Specialty Machining for over 20 years Precision-Tek has earned a reputation for solving difficult machining problems with inventive solutions. Precision Swiss turning machining: We have the ability to match your job requirements with the correct machine for optimum production and quality. Our machines are equipped with automatic magazine bar loaders for 24 hour “lights out” production when needed. Our Swiss machines can machine parts with the capacity .050” to 1.25” in diameter and up to 12” in length. 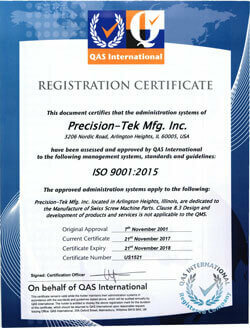 At Precision-Tek we turn around quotations in hours not days. Most of our quotes go out in less than 24 hours. We are a supplier that delivers on time, that you can put your trust in. Our Process at Precision-Tek is extremely efficient and organized in our quality department, our control data is utilized and documented, we can provide you with First article and PPap (production part approval process) inspection reports. Before processing an order, all drawings, specs are reviewed through our engineering department for process planning, which is a critical part, to avoid any unnecessary problems and to assure the quality. Production meetings ensure that the team is discussing all the issues and materials to provide quality products on time, with their deliveries. The made in the USA Advantages at Precision-Tek: Our customers count on us to solve any problems that come up in any areas during the process from engineering to inventory control, we always are flexible to meet our customers needs. Our Value Added Services are just another way that can save you time and money, with our in house tooling, our engineering, and design, documented parts production, we use the best Machine Technology, but our people is what makes us the experts in Machining and Industry Leaders. Assemblies Precision-Tek can manufacture your products and ship them to you or your customer in kits ready for assembly or fully assembled. We can make you look good, and save you time and money.